HEXUS took a close look at the Intel 8th Gen Core chips with AMD Radeon RX Vega Graphics, in as much detail as we could, during the CES 2018 in January. The information shared by Intel was quite extensive and included some 3DMark 11 and gaming benchmark comparisons but not really enough to satisfy us, nor the tech-hungry HEXUS readership. As we await further official details and actual hardware launches to fill in details missed out by Intel's presentation, it's good to see a tasty leak that looks genuine. Tech site Extreme Tech reports on a Korean-sourced leak of benchmark figures from the Hades Canyon NUC, featuring the AMD Radeon-powered Intel Core i7-8809G.The flagship of AMD's latest own brand APUs is currently the Ryzen 5 2400G with 4C/8T and a Vega GPU boasting 11 CUs, running at 704MHz (1.25GHz turbo). As we saw at Intel's CES 2018 event the Core i7 8809G and i7-8709G 4C/8T chips ship with Radeon RX Vega M GH graphics which boast 24 CUs running at base 1063MHz (1.19GHz turbo). Intel claimed its Vega M GH equipped chips offered approx 1.13x better gaming performance than the Nvidia GeForce GTX 1060 Max-Q edition (6GB). 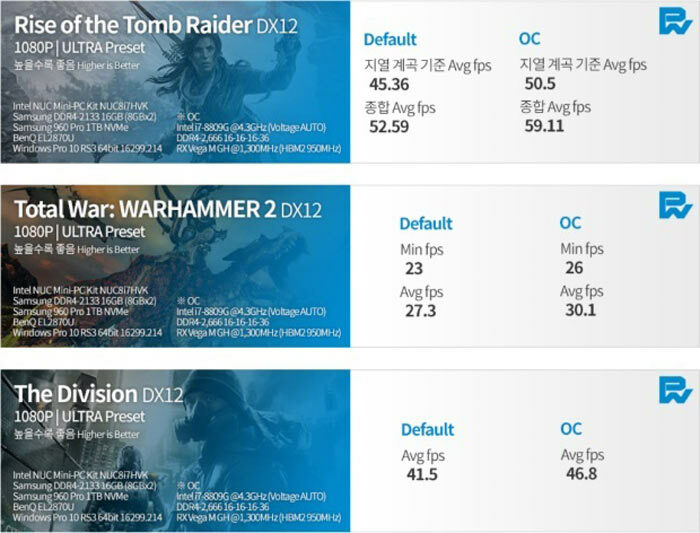 In the Korean sourced benchmarks three games were tested on the Hades Canyon NUC. The Core i7 8809G was installed alongside 16GB DDR4-2133 (8GBx2), and a Samsung 960 Pro 1TB NVMe drive, with the Windows Pro 10 OS. Default and OC (OC on CPU, memory, and GPU) speeds were tested. The benchmark data from the games tested suggest integrated graphics performance is on a par with a discrete AMD Radeon RX 570 graphics card. As this is an early sample on test things could be improved further by release. Now the question on most people's minds will concern pricing. With the outrageous pricing of RX 570 cards on the market at the moment, how much will Intel Core i7 8809G parts / systems cost when they ship? Even if MSRPs are reasonable, if such processors appeal to miners then the pricing may shoot up rather sharply. 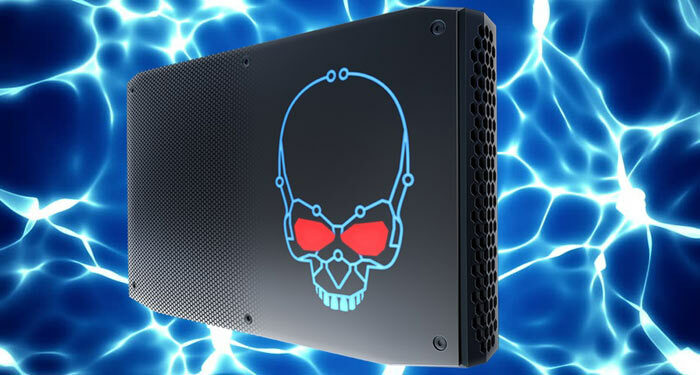 The Intel Hades Canyon NUCs will become available in Spring. Whilst these are sample chipsets being tested, what's also of importance is that these are almost certainly using in development drivers, too. I know I'm looking at the possibility of one of these systems as the replacement for my old i7/GTX680 desktop; an article I read from CES stated that the UK price worked out to around £750 for the barebones system with no RAM or storage, I can probably reuse my SSD from my current system, with a bump on my storage HDD and suitable RAM it will work out cheaper than buying an i7/GTX1060 system. Please tell me it doesn't ship with that ridiculous skull on the side. From what I remember they ship with two covers, the skull one and a plain one.